Replacement oil pump repair kit for Yamaha motorcycles. This kit suits variety of oil pumps throughout Yamaha range from motorbikes - too many models to list below. Quality rubber replacement damper for an oil tank on Yamaha motorcycles. COMPATIBLE MODELS1968-.. 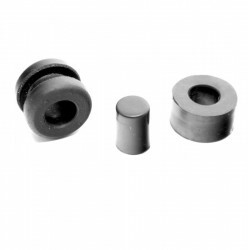 This kit contains one oil tank rubber damper (90385-10026), grommet (90480-14023) and one ..
Quality replacement water pump gasket / housing gasket for Yamaha motorcycles. COMPATIBLE..
Quality replacement guard seal / swing arm protector for Yamaha motorcycles. COMPATIBLE MODELS1967 A..